A confluence of kind-hearted people (in the right places), inspired to expand on a simple request from an influential old man, has so far enabled more than 500 underprivileged infants with serious facial deformities to smile properly for the first time. Not only have maxillo-facial surgeons across the country benefited from learning advanced surgical techniques, but top sporting folk and other celebrities have also seen the near-miraculous transformation of these little children's faces  and therefore their futures. The latest 27 tiny beneficiaries were last November given restorative surgery for a wide variety of facial abnormalities at Tygerberg Hospital near Cape Town during Smile Week, now a 6-year-old phenomenon in academic hospitals country-wide. The Smile Foundation was born of an idea that flowed from a simple request by former President Nelson Mandela to Gauteng businessman and philanthropist Marc Lubner. Madiba asked Lubner if he could facilitate surgery for an impoverished child he'd met who had a rare facial paralysis that prevented him from smiling. Lubner secured the services of top Canadian surgeons who worked with their local counterparts and realised 'the synergistic power that a co-ordinated set of surgical programmes could have on a large number of children who could otherwise not afford this'. Next came health care philanthropist, pharmacist, and former Miss South Africa (1997), Kerishnie Naiker  who happens to sit on the board of the Vodacom Foundation (the social responsibility arm of the telecommunications giant) and the Smile Foundation. During a 2007 Vodacom Foundation board meeting she strongly punted the Smile Foundation's work, telling members it was 'the kind of thing that needs showing not telling'. 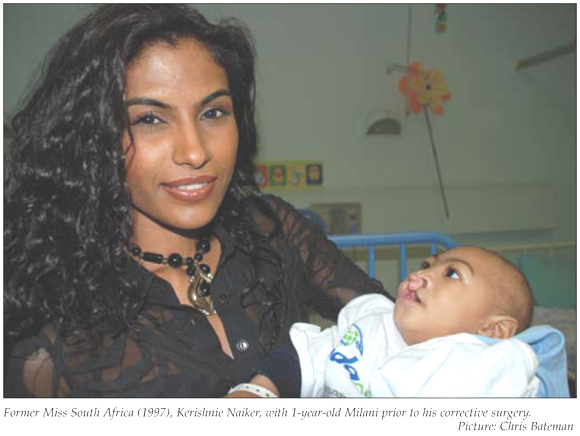 She persuaded Vodacom Foundation Chairman, Mthobi Tyamzashe (himself born with a cleft lip), to sit in on one infant's life-changing operation, in spite of his deep aversion to hospitals. To make doubly sure, Naiker got Vodacom's then CEO, Alan Knott-Craig (who spent the first 5 years of his life in leg calipers and much later suffered a life-changing near-fatal heart attack), to attend a subsequent similar operation. Tyamzashe explained that at 6 months of age he had just undergone successful corrective surgery for his cleft lip when his dad died. When he was 14 his mother died in hospital. 'I must say I felt a bit wobbly watching the operation. But I don't want anyone to suffer. Now people come to me because they say I understand. I've realised that I'm just a conduit and simply ask: can we do it? ', the former Secretary-General of the apartheid years National Sports Congress said. The rest is history and Vodacom, partly through its Tries for Smiles campaign (where R25 000 is donated for every rugby try scored in the Vodacom Super 14), weighed in strongly, adding medical equipment and follow-up treatment to its surgery funding bill. Over the past 3 years Vodacom has donated 7 million rand, adding a million during their 10th anniversary celebrations recently. This has enabled the affected infants to benefit from not only reconstructive surgery but from holistic follow-up speech and hearing therapy, orthodontics, psychosocial and occupational therapy  things Tyamzashe never had. Dr Alexander Zühlke, one of three Tygerberg Hospital plastic surgeons who with five plastic surgery registrars and the anaesthetic team, spent Smile Week operating on the infants, said the initiative slashed the waiting times for the transformative surgery. 'The ideal time to do a cleft lip is at around 6 months old and for a cleft palate at about a year, but with our normal surgical lists they wait up to a year or longer. We sometimes see people for the first time as adolescents,' he added. He estimated that, without Smile Week, Tygerberg Hospital normally operated on about half of the children on its waiting list later than was optimal for the best outcome. Children 'missed the cut' either because they were referred late or because of long elective surgery waiting lists. Zühlke said putting all the Smile Week children and parents together in a ward for a week had hugely positive social benefits as 'everybody interacts and those waiting see those who've already come out'. He said Smile Week also lifted spirits and improved morale among his colleagues and hospital staff while a R900 000 state-of-the-art surgical microscope donated by Vodacom to his team last November made a great difference to the quality of their operating time. They had previously relied on an ailing 20-year-old microscope. In an aside to Izindaba, Lubner revealed that the Smile Foundation was keeping usufruct rights on the new microscope to ensure that it was used optimally, enabling them to transfer it to another hospital if considered necessary. Referring to the first Mandela-inspired operation, he said the surgical skills to address Möbius syndrome (facial paralysis) where a functional free muscle flap removed from the thigh was transferred to the face and the vessels and the motor nerve sutured under the microscope did not previously exist locally. Professor Ron Zuker from the Hospital for Sick Children in Toronto had been flown over and taught former head of plastic surgery at Wits University and Johannesburg General Hospital plastic surgery chief, Professor George Psarras, the technique. Psarras, in turn trained Alexander Zühlke at Tygerberg, who was now training registrars. Dr Paul Ciapparelli, clinical director at Tygerberg, cited a television reality show called Makeovers where people with problems of self-esteem underwent plastic surgery for face-lifts. 'We're a facially focused species. If you can imagine growing up with these kind of deformities, that can be absolutely gripping in terms of development. We need to build our society brick by brick with people who are loved and love themselves and have self-esteem,' he said. Tygerberg was now performing twice as many corrective facial surgeries as it did during Smile Week last year, he added. Naiker said the intention was to send children home for Christmas with the ability to smile, an unforgettable experience for them and their families. She encouraged the celebrities, staff and media members present at Tygerberg Hospital last November to hug the children. 'One cannot underestimate the need of these children for love, affection and companionship, especially given the social stigma. To hug them is not premeditated. It comes to you so naturally and helps them to feel socially acceptable. It's important that they feel accepted so they can continue with their lives in a normal way. And who are we to define what is normal?,' she added. Next year the Smile Foundation begins an educational programme at government schools to sensitise children to all forms of physical deformity and will distribute a home programme speech therapy manual for children whose parents cannot access formal care.